Gamers of a certain age may remember the infamous Sonic the Hedgehog cheat code that let you meddle with the very fabric of the level itself. Want to give Sonic a million rings to collect? Go ahead. Want to build a new platform and fill it with swarming enemies? Knock yourself out. To the Ribena-addled mind of a pre-pubescent gamer, it was all very exciting ... yet simultaneously frustrating. Yeah, yeah, tinkering with base-level objects and graphics was fun. But surely more could be done, right? Why couldn't this brave new world of content creation go a whole lot further? Flash-forward a couple of decades. Level design and modding for PC games has been around for longer than many current players have been alive, while the console market has begun to take tentative steps into the world of user-created content with titles such as Halo 3, Far Cry 2 and LittleBigPlanet. Still, the vast majority of this aftermarket content remains solely of interest to the modders themselves. Either it's too difficult for ordinary players to find these mods, or the user-created stuff in question is simply too shoddy to garner much attention. There have been, however, notable breakout points, user-created maps and mods that redefine the notion of what homemade game content can achieve and even go so far as to set new standards for professional designers. Quake mappers like Ikka Keranen, Neil Manke and Pete Burrows were among the earliest prominent modders, helping user-mapping grow from Bambi-on-ice hesitancy to confident, balls-out creative strutting. Minh Lee and Jess Cliffe's Half-Life mod, a part-time university project, became the official Valve product Counter-Strike, which later featured David Johnston's "de_dust," one of the most popular multiplayer maps ever, and home to around five percent of the online player base at any one time. Valve have similarly inspired more recent user-modding: Tom Baldry's epic "Dam It!" takes the four Left 4 Dead survivors through the interior of a massive hydroelectric dam with stunning vision and clarity. But what qualifies as a success? What transforms a user-made level from embarrassing amateur-hour nonsense to gripping, heart-pounding, play-again-and-again interactive perfection? 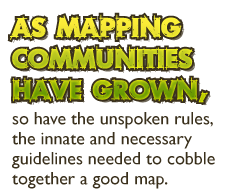 As mapping communities have grown, so have the unspoken rules, the innate and necessary guidelines needed to cobble together a good map. So, what are they? The best person to ask, it seems, would be the best-known. As the creator of "de_dust," David Johnston is a man who knows what attracts players. His three cardinal rules are refreshingly simple: "Originality, accessibility and presentation, although not necessarily in that order," he says. "Excel in just one and you're halfway there towards making a map people want to play and want to keep playing. Some of the best, most fun maps have been hideously ugly, such as the 'knives' or 'ice' CS maps, and the same applies for the other facets. Master all three, and the world is your oyster."